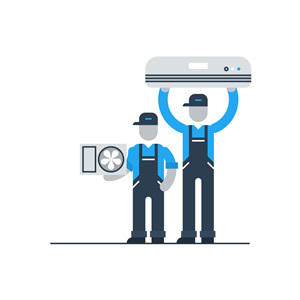 For the most efficient, quickest ducted heating repairs in Sydney, rely on SYDNEY AIR CONDITIONING REPAIR. We are committed to the highest quality, punctual services in all aspects of ducted heating units, from repairs to regular checkups. Rest assured that when you hire us as your job will be done right the first time at the most affordable prices in the city. Having years of experience in ducted heating repairs in Sydney, our team of technicians has the knowledge to identify the problem easily and quickly in case of your system’s malfunction. Our onsite repairs will get your heaters back to normal in the shortest time possible, enabling them to work as they were new. Your time and comfort are our top priorities and this is why the majority of our repairs are completed in one visit. To ensure your own safety as well as your heaters’ optimal efficiency, we recommend that you have your systems checked before the heating season starts. Preventive maintenance will not only save you from expensive repairs, but also your systems’ optimal performance will ensure reasonable utility bills as well as your families’ safety. Get in touch with us today, and one of our highly professional technicians will be at your door, ready to perform a detailed inspection to be sure that your heater operates properly and safely. Let your heaters be handled by highly trained professionals. Trust SYDNEY AIR CONDITIONING REPAIR as we guarantee all work we conduct. FOR ALL DUCTED HEATING REPAIRS IN SYDNEY, CALL NOW!